Your little kiddo has now finally transitioned from an all breastmilk or formula milk diet to starting to try their palates and tiny tooth on solid food. Making homemade baby food will definitely give you the confidence and peace of mind that you’re giving your kid only the freshest and most nutritious baby food you’ve created. That is why many kitchen-wiz parents choose to make their own baby food instead of buying ready-made ones in the grocery. Upon deciding to take the food-making task into your own hands, we assume that you will need some help, yes? Steaming, chopping, grinding, mixing and all ain’t all that easy and we know that. But worry not dear parents since baby food processors and makers are here to the rescue! There are many choices of infant food processors and makers out there. 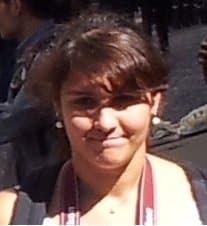 That is why finding the perfect one for you can become quite tricky. If you are a parent who is still yet to decide, you can read on to know more about baby food processors. We have included the different types you can choose from, the best ones out in the market, and how they can greatly help you with your baby food making journey. Hopefully, with this post, we will be able to help you come up with the perfect choice! This type is more of an automated option. It is perfect for parents who want a hands-off baby food making approach. It is also very helpful for parents who are very busy and could not spend so much time steaming, cooking, or chopping the ingredients. This type of infant food makers just do everything for you. This type offers parents the most hassle-free preparation, yet the machine can be complicated to clean-up since it has more parts. However, these infant food makers are the most convenient and they help you save tons of time. Unfortunately, this type may also be the most expensive one. They also tend to be a bigger machine that could take up some space in your kitchen. Food processors are mainly the food-prepping wizard in the kitchen. However, they do not pre-cook or steam the food items before the grinding process. They work well with a wide variety of solid foods. They can also grind up grains to make homemade cereals for your babies. Most food processors are very versatile when it comes to their work with food. They can have interchangeable disks to mix, puree, puree, slice, dice, chop, shred and even knead dough if required. Although food processors work only in one speed, they come with an innate pulse action and can rotate in both directions so that you can have control over the food processing. Blenders are best suited to work with food that is already mushy or almost liquid in form. They will not be able to chop and work with food that is largely cubed and are still in big portions. The blender tends to have smaller blades that are located in the most bottom part, that is why they won’t be able to process a large chunk or batch of fruits and vegetables. The blender’s ability is mostly liquefying finely chopped or mushy ingredients to create smoothies, drinks, purees, and soups. When you use the blender, it would take you more time and effort since you need to manually chop or grind the ingredients so that the blender will have no problem working with them. This type of food processor is more on the smaller size and cheaper side. Although this requires so much effort, this will be a perfect option for when you are traveling. This type of infant food processor is also a perfect back up or the one to have at grandparents’ house for a baby’s weekend stay. This may be very cheap and small but this type will require more time and effort to create the baby’s food. This infant food processor is one of the most famous and most trusted machines on the market today. It can steam, cook and blend veggies, fruits, meat, and fish to all stages of food for your little ones in just 15 minutes. What parents love about this, this is fully operated with just one hand. Processors made to create baby food that can be operated single-handedly are very helpful when babies want to be constantly held and carried. It is a great machine that can steam and blend baby food and a processor that comes with a very compact and modern design. This food processor works well with almost all the fruits and veggies that your babies love. It is purchased with removable spatulas that can be used for taking out and for raising the very warm steamer basket out from its container. This machine also boasts a function to reheat and defrost that is super helpful for heating frozen portions of baby food. 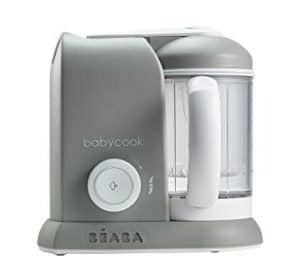 Beaba also has a multifunctional processor with two bowls, that makes it easy to produce nine cups of baby food at the same time. BPA-free, lead-free, and Phthalate-free. The Babymoov is a bit of a newcomer in the infant food processor class. But despite that it is super new, it has already made a good impression on some parents who had the chance to test this meal station. It is considered to be a very great and versatile high-rated baby food maker. This meal station is one of the few processors that can carry simultaneous and separate food blender and steamer. It lets you to multitask and proceed to steam one food while blending another. 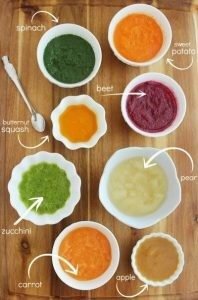 It is a great feature especially if you are making different stages of baby food for your babies. This infant food maker boasts of its amazing high capacity. It allows you to produce up to nine cups of baby food at one processing. It totally works for both small and large productions. This baby food processor looks super fancy to look at on the top of your kitchen countertop. It also has a cool-looking LED screen and interface that is super simple to use. One thing that you should consider is that this one is kind of big, so it will take a whole lot of space in your kitchen. The parts are all BPA-free and dishwasher friendly. 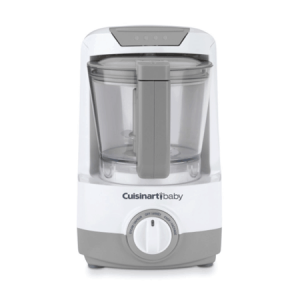 This mighty Cuisinart is also great for producing baby food in bulk since this also has a large capacity. This infant food maker plus warmer by Cuisinart is also a great multi-functional baby food processor that steams, blends, and grinds. Another great feature is its built-in bottle warmer that will heat their baby bottle onto the right temperature. Despite its great functionality, this infant food processor will not take too much space in your kitchen countertop. This machine does also a great job of working with veggies and fruits that are a challenge to blend and puree. But with the Cuisinart, all the ingredients can be possibly blended and pureed to the perfect consistency that your babies will surely love. This baby food processor is BPA free on all surfaces that touch the food. This mighty blender is famous for its ability to produce finely cut oats to make awesome oatmeal for baby. This cute Nuby blender purchased with an impressive set of accessories that includes a basket for steaming that can be utilized to thaw food in the microwave prior to blending, a soft-tipped spatula plus a nine-compartment tray used when freezing. This item claims to process baby food that will be good for a week in just a couple of minutes. Which will be super helpful for busy parents who won’t be able to do a daily baby food production. The Nuby food blender creates and delivers purees with a silky and perfect consistency that your babies will love. This set contains all you needed to get started with making, storing and feeding your little one. All pieces are guaranteed baby safe and BPA-free. Baby Brezza is one of the most famous brands when it comes to baby care. This automatic baby food allows you to do other chores at once. You can just turn this on and you can do your thing, it can puree food automatically post-steam, allowing you to do other tasks. So, creating food for your little one with the Baby Brezza is totally just a breeze. Another admirable feature is that this one comes with reusable food pouches and a funnel that will make filling them simple, easy, and mess-free. 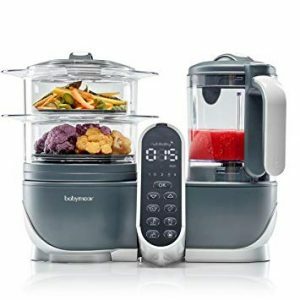 This baby food processor comes in a very modern design and contemporary appearance that will not take too much of your kitchen space. However, parents noted that not all ingredients produced a puree with good consistency. Some may require more mixing and another minute of the process. The Baby Brezza Complete One Step Food Maker is BPA-free. This hand-operated food mill is considered to be the best manual food processor in the market today. The Mash Maker is small and will be convenient to bring along. It also boasts a non-skid base to avoid slipping while mashing. Although the output comes in very small and single servings, they produce baby food with good consistency. The OXO Tot is super ideal for those who love to be on the road or to stash at the granny’s house. The Masher works greatly that purees are created resulting in a smooth texture that people would never expect that it’sa product of a manually operated device. Parents should also thoroughly chop and steam the ingredients to be able to produce a puree with a smooth and great consistency. The baby food made through manual food makers can be totally more appetizing compared to food created with high-technology baby food processors. But they also require a great deal of effort too. This manual food mill is BPA-free, PVC-free, and Phthalate-free. This small and compact mini-machine is made for stirring up baby food until desired consistency is achieved. This one is a handheld unit for a stick-style immersion blender. It is really small thus, it is super easy to store and travel with and the container was enough to produce a good batch of baby food. The ingredients should be finely chopped and steamed or even add liquids so that it can be blended properly. But some soft fruits such as blueberries come out perfect as is. One plus about this is you can use this as an immersion blender for your own purees and recipes when the baby’s all grown up. The puree and blending item by Sage Baby is BPA, Phthalate, Lead, and PVC Free. As a parent, you need to save as much as possible. You have many things to spend on (baby clothes, vitamins, other equipment) so it is nice to know that when you make your own baby food. We all know that store-bought baby food can be totally expensive. Producing homemade baby food not only saves a good amount of money but will also lessen your garbage production since you avoid getting packed foods in jars or cartons. Ingredients such as fruits and veggies that you buy in your local market are cheaper too! You can also produce large batches and save them inside the freezer using a storage tray. Commercial baby food tends to be limited only to few flavor choices. The types of ingredients used are also limited. But when you make your own baby food, the sky’s the limit! However, it is important that you include ingredients that don’t only taste good but also provide essential nutrients that your baby will need. You can prepare your own combination of herbs, fruits, veggies, and flavors that are nutritious and delicious that baby will surely love. Nobody wants too much preservatives, chemicals, and too much sugar in your baby’s food right? And we can’t avoid a few of those in store-bought baby food. If you make your own baby food at home, you get to choose the ingredients you want to include. Additionally, you exactly know what you’re feeding your little one. Quality control is also necessary, and when you produce homemade ones, you definitely have the control. You get to choose only fresh and non-GMO fruits and vegetables. And if it pleases you, you can also make your homemade baby food completely organic. Because you don’t add any preservatives or sweeteners in your baby food, you are sure that you are only giving them pure nutritious food. You also get to decide to only steam your ingredients so that the valuable nutrients will be retained. Baby’s nutrient intake is truly important for growth and development. That is why it is important that you ensure a balanced diet with great nutritional value through producing good homemade baby food. Of course, you get to shop and buy your own ingredients when you make your own baby food. And by doing that, you get the chance to pick only the freshest ingredients for your baby food recipe. Commercial baby foods are cooked at extreme procedures and heating to avoid contamination and they sit on the shelves for a longer time before they get consumed. The freshness of homemade food, even for adults, is totally different – and it is definitely a good kind of different. The fact that you can give your baby the same food which comprises the same ones on your dinner table, is really great. It can help them get used to your usual family menu and decreases the chance for them to become a picky eater. If you are a busy parent with more kids than one, baby food preparation may take so much of your time. Finding time to prepare a good batch of baby food on a daily basis may also be difficult if you are a parent who has tons of work to do. Unless you’re a professional chef, it is inevitable to produce batches of baby food that may taste gross. There’s a reason most of the commercial baby foods are loaded with sugars and sweeteners. And we know that not all veggies and fruits do taste good. Your baby food might also turn out bad if you’ve used unripe fruits. Or, you mixed ingredients that don’t complement each other. Of course, you do not add preservatives to your homemade food. That is why when you have produced more than what your baby can consume. You need to refrigerate or freeze them immediately to avoid spoilage. This will eventually take up space and requires you to secure many storage cups or boxes too. Commercially prepared and packed baby food can be easily taken anywhere when you travel. Another thing is they don’t even need to be refrigerated. Of course, you can always bring your homemade baby food along with you, but it requires good storage, and ice box even. Taking homemade baby food with you when traveling is not that hassle-free. Creating a homemade food from your baby is truly a fun work to do. This also should be done because you chose to do so, and not because you were pressured by the people around you. Since you are the parent of your precious little one, you are the one truly responsible when it comes to determining what is perfect for your children and the whole family. We would love for you to make an effort and read on to decide what would be really perfect for you and the whole family’s way of life. With tons of items to choose from in different price ranges, we absolutely know there is a perfect fit for everyone, even with no award at all.